Ultrafiltration for Bioprocessing is key reading for all those involved in the biotechnology and biopharmaceutical areas. 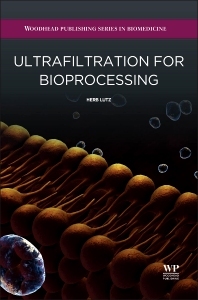 Written by a leading worker in the area, it includes many practical applications and case studies in the key process of ultrafiltration (UF), which is used in almost every bioprocess. Herb Lutz has degrees in chemistry and chemical engineering from the University of California, Santa Barbara and attended graduate school in Business and Chemical Engineering at MIT. He has worked in the area of separations and purification for 30 years. Herb is a principal consulting engineer with Millipore Corporation and currently focuses on the development, validatation, scale-up and trouble-shooting of new downstream purification applications such as virus clearance, sterile filtration, clarification, tangential flow filtration, chromatographic purification, and membrane adsorbers. He has also worked in product management, and strategic marketing. As a thought leader in the field, Herb is a frequent conference presenter, chair and has assisted in organizing several conferences. He has published several book chapters including the Membrane Separation Section of Perry’s Chemical Engineer’s Handbook, holds a filtration patent, is on the scientific advisory board for Biopharm International, and has published in the areas of scaling, ultrafiltration, membrane adsorption, integrity testing and virus clearance. Mr. Lutz has taught membrane applications for Millipore, for the ASME Bioprocess course, and for the Society for Bioprocessing Professionals.